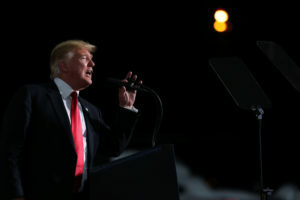 LUKE AIR FORCE BASE, Ariz. — President Donald Trump on Friday called Saudi Arabia’s announcement that suspects are in custody in the death of journalist Jamal Khashoggi a “good first step” and said he would work with Congress on a U.S. response. The president spoke to the media at a defense roundtable in Arizona hours after Saudi Arabia claimed that Khashoggi, a Washington Post contributor last seen on Oct. 2, was killed in a “fistfight” at the Saudi consulate in Istanbul. The kingdom also said that 18 suspects were in custody and that intelligence officials had been fired. Asked by a reporter whether he thought Saudi Arabia’s explanation for Khashoggi’s death was credible, Trump said, “I do. I do.” But he said before he decided what to do next, he wanted to talk to Saudi Crown Prince Mohammed bin Salman. On Capitol Hill, lawmakers including Trump ally Sen. Lindsey Graham expressed skepticism of the Saudi account, which was vastly different than that given by Turkish officials, who had said an “assassination squad” sent by the kingdom had killed and dismembered Khashoggi. Khashoggi, a prominent journalist and royal court insider for decades in Saudi Arabia, had written columns critical of Crown Prince Mohammed bin Salman and the kingdom’s direction while living in self-imposed exile in the U.S. He went to the Saudi consulate to obtain paperwork for his upcoming marriage. Democratic Rep. Adam Schiff of California said Saudi Arabia’s claim that Khashoggi died in a brawl wasn’t credible. “If Khashoggi was fighting inside the Saudi consulate in Istanbul, he was fighting for his life with people sent to capture or kill him,” said Schiff, the ranking member of the House intelligence committee. “The Kingdom and all involved in this brutal murder must be held accountable, and if the Trump Administration will not take the lead, Congress must,” Schiff said. Earlier Friday, Sanders said Secretary of State Mike Pompeo had spoken to the crown prince and briefed the president and John Bolton, Trump’s national security adviser. Trump dispatched Pompeo earlier in the week to Saudi Arabia and Turkey to speak to officials about the case.